Sunday January 23rd 1898 The young folks went on to town this morning. I was busy with the work all forenoon. I looked over old letters and papers all afternoon. Frank Stevens was here. Monday January 24th 1898 I churned and got the work done so we had dinner early and Will and I went to town in the cutter. We spent most of the afternoon over home and had such a good visit. The evening spent about as usual. Tuesday January 25th 1898 There was a terrible snow storm today with a wind that drifted very bad. I did the cooking and cut up a lot more of old carpet for a crumb-cloth. 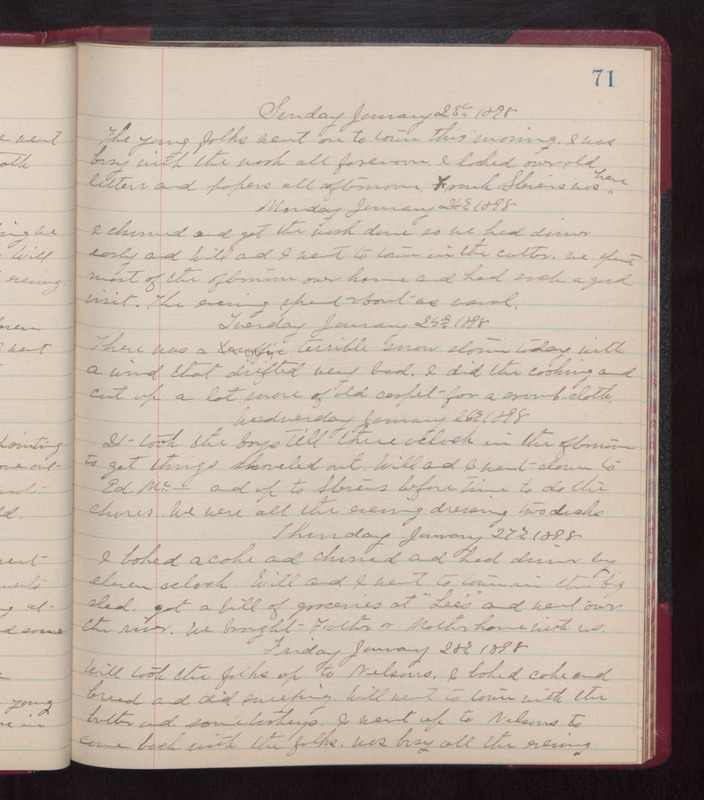 Wednesday January 26th 1898 It took the boys till three oclock in the afternoon to get things shoveled out. Will and I went down to Ed Mc-- and up to Stevens before time to do the chores. We were all the evening dressing two ducks. Thursday January 27th 1898 I baked a cake and churned and had dinner by eleven oclock. Will and I went to town in the big sled. Got a bill of groceries at "Lees" and went over the river. We brought Father & Mother home with us. Friday January 28th 1898 Will took the folks up to Nelsons. I baked cake and bread and did sweeping. Will went to town with the butter and some turkeys. I went up to Nelsons to come back with the folks. was busy all the evening.